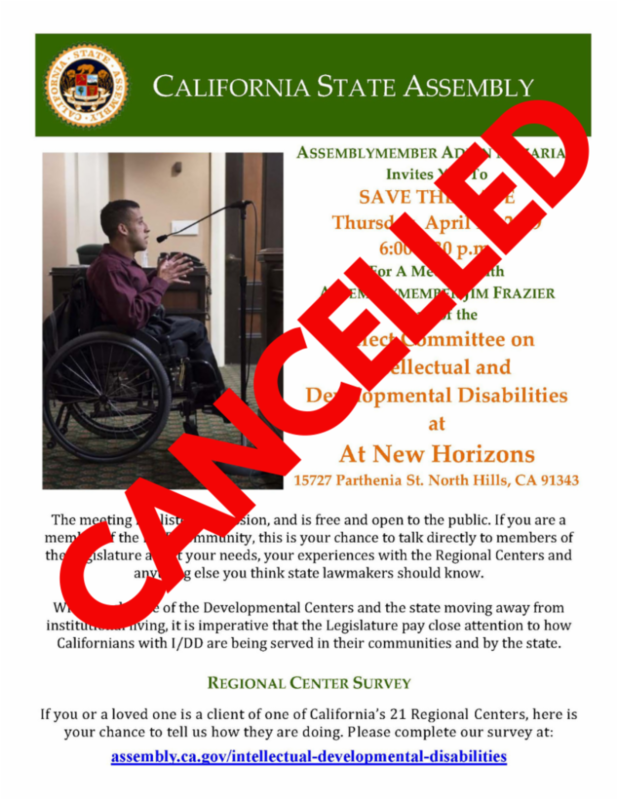 "Due to unforeseen circumstances Assembly member Jim Frazier, chair of the Select Committee on Intellectual and Developmental Disabilities, must cancel the April 18 hearing that had been planned for New Horizons in North Hills.It is with great regret that Assembly member Frazier must make this decision. He hopes to schedule a hearing in the greater Los Angeles region in the future." To keep informed of future hearings, check the Select Committee’s web page:https://www.assembly.ca.gov/intellectual-developmental-disabilities.All live-streamed Select Committee hearings will be linked at this page and you can view archived video of previous hearings of the Select Committee. The meeting is a listening session, and is free and open to the public. If you are a member of the I/DD community, this is your opportunity to talk directly to members of the Legislature about your needs, your experiences with the Regional Centers and anything else you think state lawmakers should know.